When I started reading personal finance blogs last year, I stumble upon the fact that all bloggers were expressing one common point: "You can't let your money sleep in some bank savings account and earn interest between only 1 and 2% , or even worse under your mattress! YOU. MUST. INVEST." After reading this advice, I started to dive into the investment topic to get to understand the sense of "make dollars working for you every single minute". I got to read various topics about stocks, bonds, markets, ETFs, and so on and so forth. At least that was my case until an awesome guy onboarded me: Jesse Mecham, the founder of YNAB. He did setup a free 10 days course via a newsletter email that started like this: "When You Want to Start Investing...". During this class I learnt basically all what you need to know except the financial advanced terms that people like because they feel more smart during mundane dinners. You can download the whole crash course here. I think Jesse managed to transfer the key principle through this course so that you get into the investing game: you need to get started! By any mean, from any small amount every month, the first thing you need to learn is how to start!!! I won't try to sum up all what Jesse wrote because it is already well condensed in less than 10 pages. What I'm gonna do is to get you up and ready to invest on the Swiss market because this latter has some specificities not covered by Jesse's US focused article. So my hypothesis for the rest of this article is that the currency in which you want to invest is mostly CHF. So, be sure you have about 2.5h ahead of you, grab a cup of coffee, sit down, relax, and...let's go! Or in other simple words, do you plan to withdraw your invested money during the next five years? Or after 5 years and more? How much do you want to invest every month? Like from today on, do you plan to put aside CHF 50.- ? CHF 100.- ? Or CHF 500.- ? It is completely up to you! Even if it is a small amount, the most important thing is to know it and to start! NOW! Let's stop here for five minutes. Take a sheet of paper, and write down your two numbers answering the questions above. OK? Are you done? You really need to read this PDF now! This will be one of the hours of your life with the best ROI. Once you are over, come back and jump to step 2. Just in case, the PDF link here again. Let's assume that you are 30 years old. If your plan is to withdraw all your savings in less than 5 years (no matter if it is for traveling the world or buying your first house), then you will need to invest 30% of your savings in shares (the number 30 comes from your current age), and the 70% left into bonds to secure most of your assets. 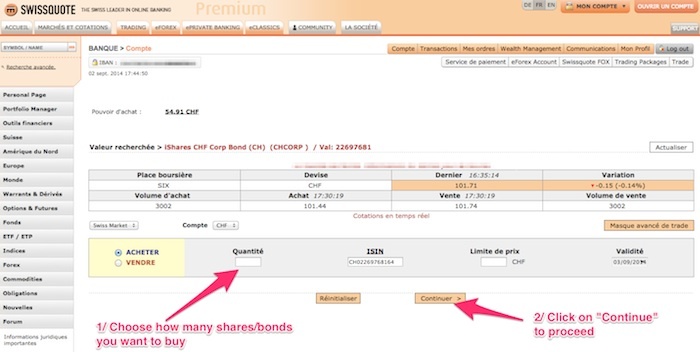 On the opposite, if your plan is long term investment like 10 years or more, then you will invest 70% into shares, and 30% into bonds. On the short term, you might not have a good ROI, but on the long run it will be the most efficient plan. OK, great, you got your investment ratio defined. Let's do some real stuff! Move on to step 3! That's actually one of the key points because that's the one that requires you to take action. If you have read the PDF crash course above, you might have googled about Betterment. Unfortunately, at the time of writing, this service is still for the US market only. On the other hand, except the awesome user experience they provide and the no-transaction-fee policy, all what they do is to invest your money...as you could do it by yourself! And this is the goal of this current article! I don't recommend to use Swissquote anymore. I advice you to read my top 3 of online brokers for Swiss investors to know more about my new choice. 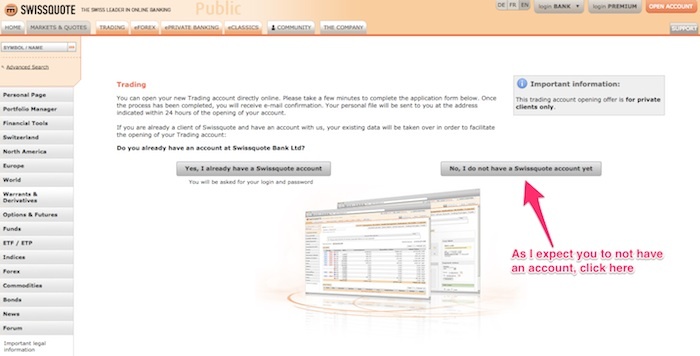 After you finished to fill the form, you will receive by post mail a card allowing you to authenticate on the website. Don't we afraid by the overly complex and complicated user interface at the moment. I will guide you through with screenshots in a minute. 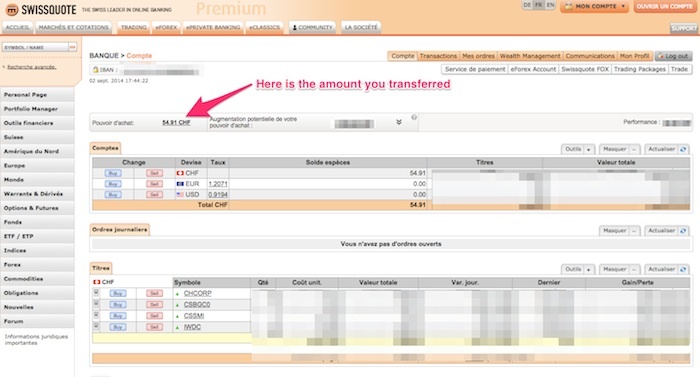 Login onto your ebanking platform (Crédit Suisse, UBS, or whatever is your bank) and setup a permanent monthly transfer so you don't have to think about it. The more automatic it is, the less you will be tempted to use this money for something else. 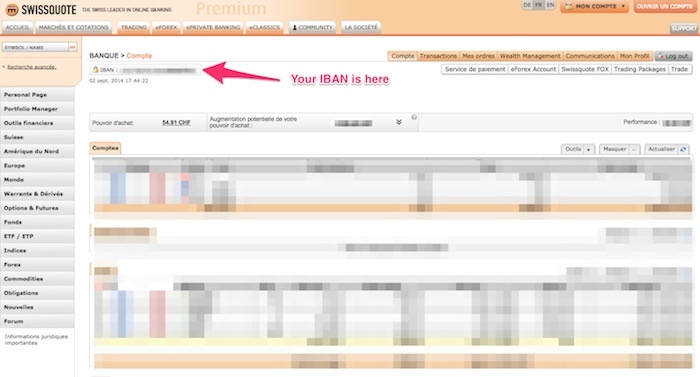 Also, don't forget to add the automatic and recurrent transfer to YNAB . Swiss SMI Index that represents shares from biggest companies in Switzerland. The MSCI shares index is worldwide but protected against currency variations. It is a global index, so very diversified, but protected against the "country" risk. This a bond index but composed of companies. It is a bit riskier than state bond market, but it pays better. I created a dedicated portfolio page that I update on a yearly basis in order to support my financial goals. Be sure to visit it to have the latest version of my investment choices. Let's assume your first investment is CHF 1'000, that you are 30, and that you plan to withdraw the invested money later than in 10 years. Step 6: Champagne!!! You are done!!! So, that's it! Congratulations!!! You just entered the Wall Street world ala Leonardo Di Caprio!!! Was it hard? No? Will you get rich on the long run? If you followed the 6 steps above, then the answer is most likely a big YES! 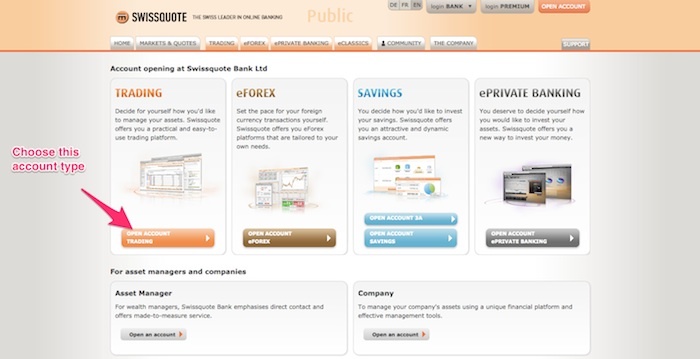 One last pro tip: there are transaction fees that Swissquote is charging you (about CHF 12 for the ETFs above) for every transaction you make. 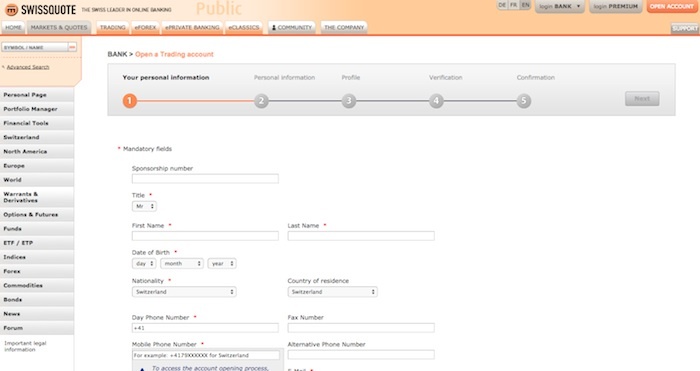 For instance, the step 5 would represent 4 transactions, hence CHF 48 of charges. What I usually do is to buy one ETF type per month so to lower the fees. Then I get the investment ratio balance aligned on four months. So, now you have all the cards at hand to start building your wealth right now. Remember that your best ally is your youth. The sooner you start, the richer you will be in the end. Please let me know via the comment section below if you had all the necessary steps listed and described with enough details to get you onboarded. YNAB is a "personal home budget software built with Four Simple Rules to help you quickly gain control of your money, get out of debt, and reach your financial goals!" I will soon write an article about why I love it so much! Until there, you can click on the following link to buy it now with a 6$ discount.